I am 46. Male. 5 ft 10 inches 83 kgs weight. I would like to follow your schedule Beginners Running Program 2. Now just last week I had started walk/run (before I read your site). I discovered I am badly out of shape and overweight. The first day after a walk of 5 min, I could barely run 30 steps at a stretch. Again I walked and soon made 1 x 30 steps + 5 min walk three times, for the first day. The next day I could make 180 steps total. The next 270 and then 320 steps total. All throughout I just listened to how my body felt - stopping when it said no. I took the next day off. Now I plan to start the schedule from tomorrow. The question is I am not even into 1 minute run just a few steps! So is it ok to down size it 1 min or less of run and give more time to adapt? 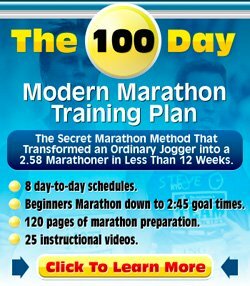 Thanks for your question about Beginners Running Program 2. Happy to hear you are considering using one of my running programs. My beginner running programs are just guidelines. They are ways to get you to 15, 20 or 30 minutes of running consecutively. But they are not meant as something you have to follow to the letter. So, feel free to adapt the program to your own needs. Run at least three times a week every week. Build your running time up, but build it up slowly. Over time, reduce the time spent walking. So go ahead and change it to your hearts' content using the above guidelines. You will get better at this. 8-12 weeks from now you will be laughing and thinking back of those first few days when you were not able to run a minute consecutively!